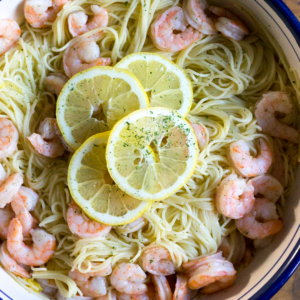 Roasted Shrimp & Lemon Pasta is a 20-minute dinner that’ll knock your socks off and become a weeknight favorite! Easy dinners are a godsend during the week. Between homework, band practice, and trying to clean up from a day of cooking and photographing recipes, I just want a dinner that I can have now. Like right now. And I really don’t want to do a bunch of dishes afterward. This pasta recipe is the answer to all my dinner prayers. It’s a one pan one pot recipe that’s ready in 20 minutes start to finish. While I love pasta dinners, most of the time I’m using a tomato sauce or alfredo sauce. They are great sauces, don’t get me wrong, but something lighter during the warmer months will always get my vote. The lemon pasta in this recipe is full of bright citrus flavor and pepper that doesn’t leaving you feeling heavy after dinner. Which to me means I can have more bread with my pasta. I’m a carboholic, what can I say? 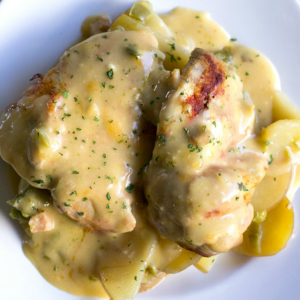 My husband goes back for second every time I make this recipe andI know your family will too! 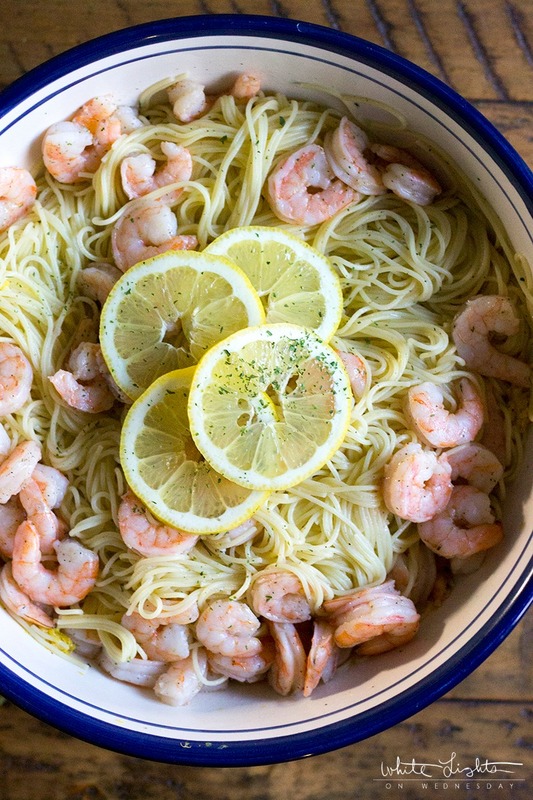 Roasted Shrimp & Lemon Pasta is a 20-minute dinner that'll knock your socks off and become a weeknight favorite! Place shrimp in a bowl and toss with oil, salt, and pepper. Spread shrimp out on a sheet pan that's lined with parchment paper or a silicone mat in a single layer. Roast for 6 to 8 minutes, just until the shrimp is pink and cooked through. Why the shrimp is cooking add 1 tablespoon oil to a pot of boiling water. Add the angel hair pasta to the pot and cook according to package directions until al dente, about 3-5 minutes. Reserve 1/2 cup of the pasta water, then drain the pasta. Transfer the pasta to a large bowl and immediately add the butter, oil, pasta water, lemon zest, lemon juice, salt, and pepper. Stir to evenly coat the pasta with the rest of the ingredients. Add the shrimp to the bowl, and garnish with lemon slices and parsley if desired. Serve immediately. We like ours with some crusty bread. 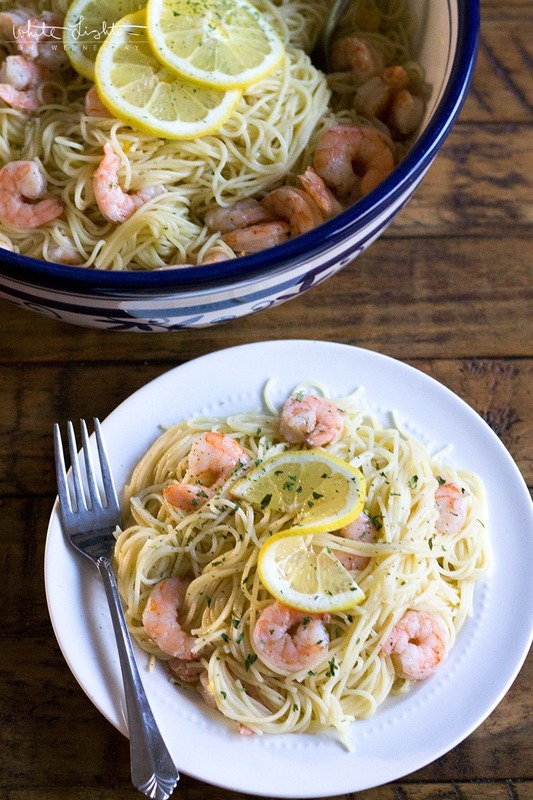 I usually use a smaller shrimp, like 61/70, for this recipe so there's more shrimp mixed in with the pasta. If you prefer to use large shrimp you can absolutely do that as well, but you may want to increase the amount to 1 1/2 pounds. That looks yummy! Only my huz is allergic to shell fish. Looks like mama is making it for one!